When Overkill’s The Walking Dead was first announced over four years ago the game went straight onto my most anticipated list, mostly because I was still an avid Payday 2 player at the time. But then Overkill and 505 Games flipped the bird to console players of Payday 2 and decided to sell the game back to players whenever they could be arsed putting out an update, and all the while the PC community were getting constant updates and new content – both free and paid. Couple that with the disaster that was RAID: World War II, the multitude of delays for Overkill’s TWD (OKTWD) and the fact that after four years of development they couldn’t simultaneously release the PC and console versions, my excitement for the game had all but evaporated and I was left with a bitter realisation that it was likely going to be more of the same. Sadly, while OKTWD has some improvements and there is some fun to be had, the game is bogged down by laborious mission design and poor game design in general, meaning yes, it’s just more of the same frustrating fun. Unlike Payday, OKTWD features a narrative, one that is based on the original comic series and not the TV series, with Overkill given free rein to create its own story and characters within the TWD universe. Set in Washington D.C., you play as one of four (six once you unlock them all) survivors – all with their own styles and perks – who must scavenge supplies for a rival gang known as The Family as well as your own camp. The concept is kind of cool and interesting – however it feels very much like a reworking of the Negan storyline from the TV show. Not a bad thing, but not exactly original. There are ten missions and all of them are pretty straightforward and linear. You’ll either infiltrate a rival faction’s outpost and steal/reclaim an item(s), such as a water purifier while dealing with the threat of zombies, or you’ll stay at your own camp and defend it from The Family’s attack. You’ll have objectives you’ll have to complete in order to succeed, such as finding the fuses to unlock a door or finding fuel tanks to juice up a forklift. It sounds mundane and simple in nature (and it is), but the louder you go the more zombies you’ll attract, and once you’ve drawn a horde it’s easy to get overrun – especially if you’re only rocking the mission in only a pair. That is until you’ve levelled up and unlocked weapons that allow you to essentially one-hit kill zombies. In one of my first missions I had a player join our session who had already completed the game and was single-handedly carrying us through the mission. On one hand it was nice to have the red-carpet treatment, but on the other hand it took all the sting out of the mission – knowing that throngs of walkers could be cut down with such ease with a machete. Which character you choose to play as can also influence how you approach missions. Aidan is a Tank, meaning he’s got the goods to go head first into trouble, whereas someone like Maya carries a health bag with her and will allow other players to heal without the need to craft health items. It’s important that to have a good spread of characters so that every character’s talents are being used. During missions you’ll need to scavenge for supplies that will go towards your camp’s stash and what you give to The Family, as well as those that can be used for in-game crafting (bandages etc.). You have a minimum requirement that needs to be met – so the more you scavenge, the more you have for your camp and its upgrades (we’ll get to that a bit later). Furthermore, you will gain XP from completing missions as well as rewards (although these can only be claimed from the camp leader), with missions having a level requirement of sorts, which often force your hand to grind to the required level. 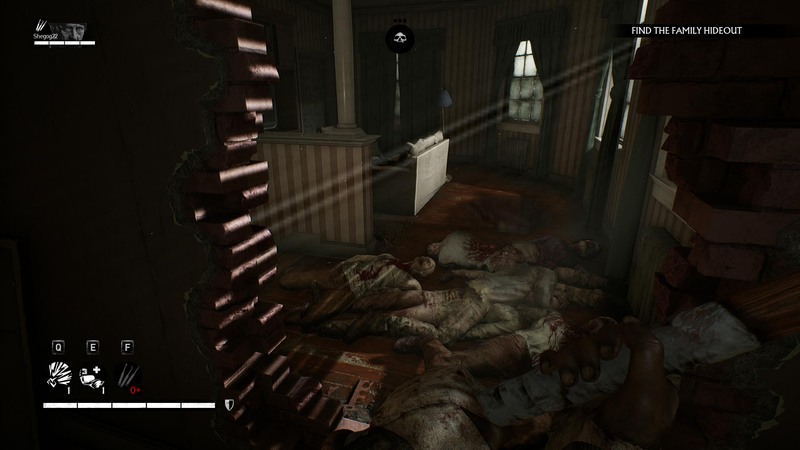 The camp defence missions are particularly a drag given they’re simply waves of enemies trying to either steal your supplies or feast on your flesh. Simply put: they’re boring. Sure you can set traps (barbwire) which will slow down the assault, but having to board-up gates is one of the most monotonous video game objectives I’ve ever had to do. Missions and mission rewards are given to you by the camp leader back at camp HQ. This means that you have to go back to camp after every mission in order to get the next mission, a weird design choice given that it can take up to a couple minutes each time you load in or out of camp. A simpler, more efficient method would have been to allow players to select new missions via the map, a la Payday, cutting out unnecessary loading wait time. Gameplay-wise, if you’ve played Payday then you know what to expect. The AI is about as clueless as Australia’s current Prime Minister, which is acceptable for zombies, because all they want to do is feast on you, however the human AI is perhaps dumber than the zombies. They’ll frequently run in front of you in a dash to get behind cover but without attacking you, and when they are behind cover they’re usually quite exposed, essentially making them target practice. To its credit, the gunplay feels rather meaty, with guns packing a punch with and without modifications attached. It’s good feeling when you mow down a horde of walkers with Aidan’s shotgun. 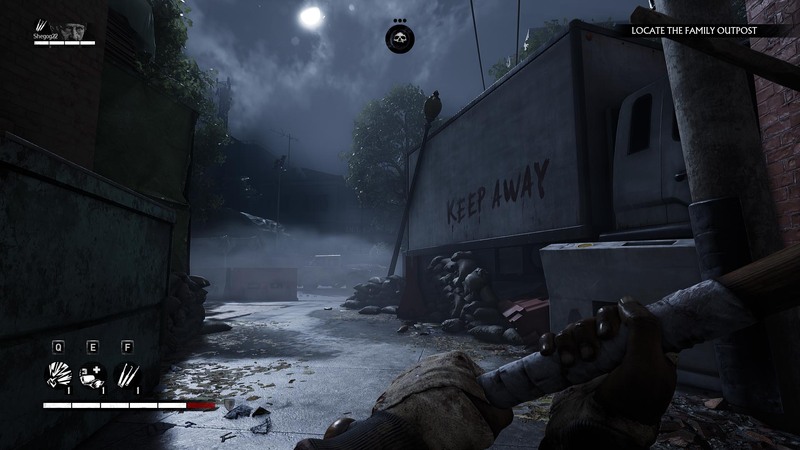 Melee weapons are also pretty fun to use, with Aidan’s trusty baseball bat claiming many zombie lives. If you were hoping for a fleshed-out story set inside the TWD universe then sadly you’re going to be disappointed. While there are reasons for doing what you’re doing, which are explained in semi-boring pre-mission cinematics, the whole premise feels like it’s been crafted with sticky tape, and as such there’s almost no reason to care about your characters, camp or its band of survivors. The biggest misfire is the lack of character development. 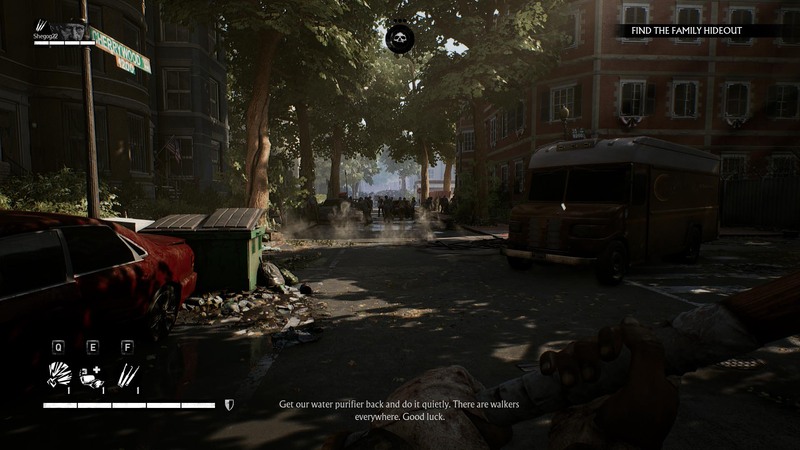 You’re playing as a survivor in a zombie apocalypse, so you’d figure they would have an interesting back story to tell about their travels. Instead, all we get are a few maladroit one-liners from characters as you engage with them at your camp. Hopefully this is something that is addressed in Season Two, which Overkill has stated is due this year. Probably the game’s biggest asset is its deep upgrade system that it offers, which gives players a host of elements to upgrade. First there’s the character upgrade system, which contains two types of abilities – character abilities and core abilities. 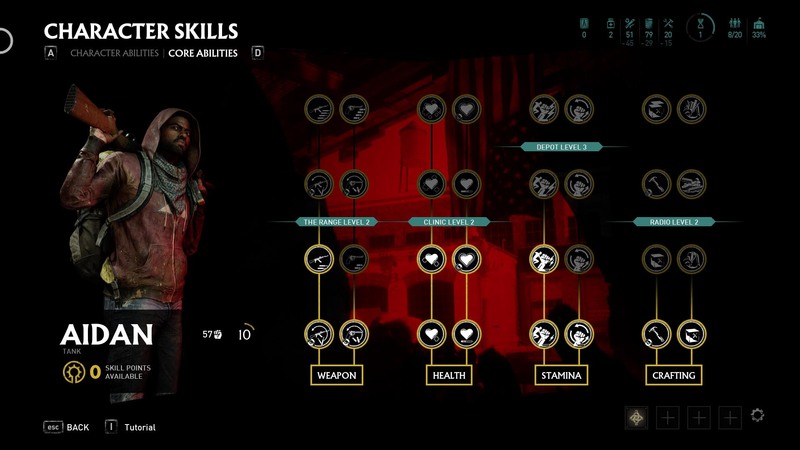 Character abilities are upgrades that are specific to your character such as increased shotgun proficiency for Aidan, while core abilities are upgrades available to all characters, such as increased health or stamina. Both of these use skill points which are acquired after each mission. Players will also need to upgrade their camp thanks to a slew of available upgrades, with some mandatory in order to progress. There are five camp upgrades categories, each with their own level tiers, so it’s easy to be overwhelmed early doors by the sheer number of upgrades. Furthermore, each upgrade uses your camp supplies, so it can be a balancing act with what you choose to upgrade. The Hub, for example, will open up the map further and reveal missions, while The Depot allows you to upgrade Tank class survivors, unlocks Stamina-based core abilities and areas of the Depot Work Station. 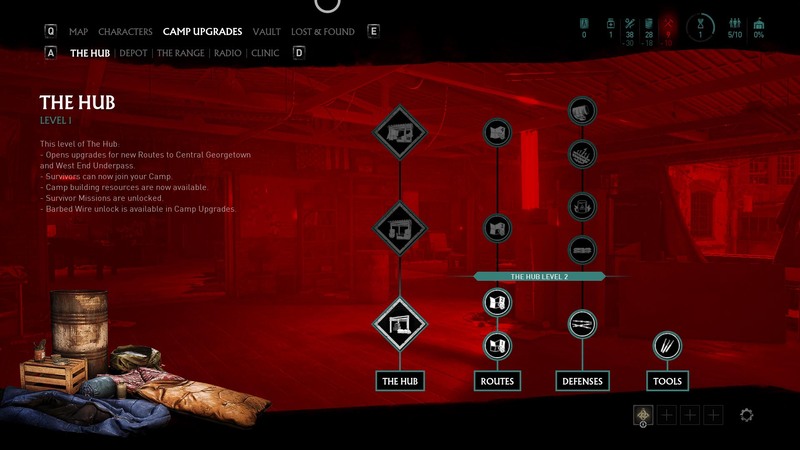 Survivors are acquired during story missions and you can choose to integrate them into your camp should you have the space. However, they need to pull their weight, and as such can be sent on missions to collect supplies or assigned to a work station that will provide in-mission boons such as faster health regeneration. From a performance and production viewpoint, the game is satisfactory. The visuals are good and sell the ramshackle Washington look, but it’s not the prettiest apocalypse I’ve seen. The voice-acting does leave a lot to be desired and helps keep the story care factor to a minimum. While I suffered from occasional lag, the most frustrating aspect was players joining my session who were then frozen in time, seemingly unable to move until they were eaten and had to be respawned back in. Plus, if you weren’t the party leader, more often than that the game would fail to take you back to the menu after a mission, forcing you to restart the game after every mission. In all honesty I wanted nothing more than to enjoy this game. After all, I loved Payday 2, and spent hours upon hours replaying the same missions with mates for sometimes nothing more than just to hang out. But while there are new ideas in OKTWD they are poorly executed, and even the old ideas it reheats are no better than what we’ve seen before. While it offers a deep upgrade system, it’s a little much, especially as the game gives you no reason to care about the characters or camp. OKTWD is easily at its best when you’re playing with mates, but even then it’s a matter of how much humdrum game design you’re happy to put up with. Overkill and co. seem to have big plans for OKTWD, hopefully we get something more enjoyable as time goes on.